Posted on October 29, 2015 | Comments Off on So You Think You Can Multitask? While the brain can have only one “conscious” experience at a time, it can run multiple simultaneous “automatic tasks” that use unrelated mental and physical resources. Natural activities, such as eating or walking, place less demand on the prefrontal cortex when compared to activities such as reading or driving, which is why we can eat while we check emails or have a conversation while out walking. The brain’s networks that host repetitive or mechanical actions don’t need conscious engagement for their operation. But when our brain has to shift focus from one task to another, it causes us to lose efficiency. This is why talking on the phone while driving can lead to poor communication in addition to traffic infractions and slowed reaction times. In other words, the brain can’t multitask on “conscious” experiences but it can on “automatic” activities that don’t require conscious engagement. Research has found that when we single-task, the brain uses both the left and the right sides of our prefrontal cortex. This area of the brain is part of our motivational system that springs into action when we need to pay attention and communicates with other brain systems to carry out the task. When the brain has to switch between two similar tasks, such as writing an email while talking on the phone, the brain toggles between the two tasks and the two sides work independently. So, yes, the brain can divide resources fairly easily for two similar tasks, but add in a third task and things start to get tricky. When a third task interrupts the second task, the brain starts crashing, performance suffers, the error rate goes way up and response times plummet, possibly because of the physical limitations of having only two frontal lobes. So while we are often required to perform many tasks simultaneously, this juggling can lead to greater inefficiency. Each time we switch tasks in rapid succession, we are required to reorient ourselves to each task, which takes time and attention. A recent study by David E. Meyer, University of Michigan Department of Psychology and Jeffrey E. Evans, University of Michigan Medical Center, Department of Rehabilitation Psychology and Neuropsychology concluded that switching what you are doing mid-task increases the time it takes to complete both tasks by 25%. Multitasking not only slows us down, it increases the chances of making mistakes and negatively affects our ability to pay attention and recall information. While we are processing information, disruption and interruptions distract us from effectively focusing on the task at hand. Studies show that multitasking compromises the working memory and the ability to store information for short periods of time. So when we are demanding that our brains toggle quickly between tasks, we are depleting our energy, causing brain fatigue and accomplishing less than we think we are. Negative side effects of multitasking are believed to include short-term memory loss, long-term stress and a reduced ability to ignore external distractions. Habitual multitasking impairs our ability to do any task well. And although single-taskers actually perform better and report higher satisfaction with their completed work, expectations that require multitasking seem to be the norm. What can you do to avoid the perils of multitasking? Multitask only when necessary, and not for convenience or out of habit. Giving total attention to a task or when connecting with a person allows you to fully experience the event. To be fully present is now a rare thing. When we never truly focus, we lose our ability to do so. Many of us likely can’t remember the last time we did something without trying to do something else at the same time. Remember, attempting to juggle too many things at once makes it hard to get anything done at all. Society has placed such an erroneously high value on multitasking that we have come to believe that we are not productive unless we are engaged in multiple activities. Yet, science shows that chronic multitasking is toxic and damaging to our health. When we concentrate on one task, we can complete the task to the best of our abilities. Our work becomes more focused. We become more effective. Our concentration, energy levels, creativity and decision making skills improve. Our lives becomes more meaningful. Old habits, such as constantly checking email, connecting to smart phones or opening multiple tabs on the computer, are hard to break. Adopting healthier operational habits can train your brain to think more strategically and efficiently, improve your cognitive strategies, rejuvenate your mind and increase accuracy, innovation and speed. Better brain health may just begin with single-tasking baby steps. Start by giving your full attention to a single task for at least 30 minutes each day and consider putting that smart phone away while driving. 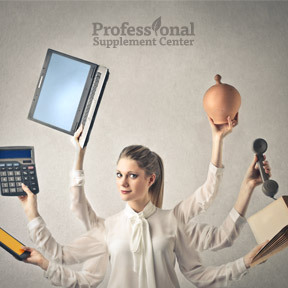 This entry was posted in Home and tagged Multitask, Multitasking, Professional Supplement Center, Vitamins and supplements, www.professionalsupplementcenter.com. Bookmark the permalink.